If you've had gestational diabetes in one pregnancy, what are the chances of having a second gestational diabetes pregnancy? A 2010 *study published in the American Journal of Obstetrics & Gynecology found that out of 65,132 pregnant women, those who had gestational diabetes during their first pregnancy had a 41.3%, or 13.2-fold increased risk of having a second. Those who had gestational diabetes in their first pregnancy but not their second, had a 6.3-fold increased risk for developing gestational diabetes during their third pregnancy. The study also found that in 13,096 women who had gestational diabetes in both their first AND second pregnancies, they had close to a 26-fold increased risk for developing gestational diabetes in their third pregnancy. Risks of GDM in the second pregnancy among women with and without previous GDM were 41.3% and 4.2%, respectively (OR, 13.2; 95% confidence interval, 12.0–14.6). The recurrence risk of GDM in the third pregnancy was stronger when women had GDM in both prior pregnancies (OR, 25.9; 95% confidence interval, 17.4–38.4). Hispanics and Asian/Pacific Islanders have higher risks of recurrence. A pregnancy complicated by GDM is at increased risk for subsequent GDM. The magnitude of risk increases with the number of prior episodes of GDM. These recurrence risks also showed heterogeneity by race-ethnicity. A 2018 study on 426 women with GDM, published in Nature, Scientific Reports suggests that higher postprandial (post meal) blood sugar levels show an increased risk of a second gestational diabetes pregnancy. Inter-pregnancy interval (time between pregnancies) and parity (number of times a woman has been pregnant) may have an impact on having a second gestational diabetes pregnancy. A study published in Endocrine in 2016 found that a shorter time between pregnancies led to a more women having subsequent GD diagnosis. Also that older women who have had more than one child who were diagnosed with GD earlier in the previous pregnancy with higher GTT results and required insulin therapy were at an increased risk of a second gestational diabetes pregnancy. This study examines a large and diverse sample of women during a 22-year period, which led to a variety of IPIs. It allowed us to show that a shorter IPI is better when we aim to avoid GDM recurrence, which was a controversial conclusion in the past. In addition, we concluded that older multiparous women, who were diagnosed with GDM early during the pregnancy with high OGTT results and were treated with insulin, are at increased risk for GDM recurrence. 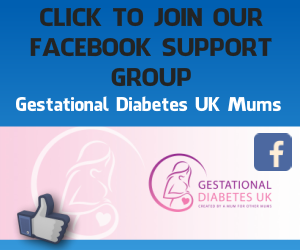 With the chances of a second gestational diabetes pregnancy being pretty high, is there is anything we can do prevent the risk of a subsequent GD diagnosis? If your body mass index (BMI) is 30 or more, then losing weight will improve insulin resistance and means you are not at such a high risk of developing gestational diabetes. Whilst there is no guarantee that losing weight will mean that you avoid a second gestational diabetes pregnancy, reducing your BMI to a healthy level will be beneficial and will improve insulin resistance. This is a tricky one, as it can open the age old debate on what is classed as a 'good', or 'healthy' diet. In the knowledge of the impact of carbohydrates on blood sugar levels we feel that a lower carb diet is beneficial. A REAL FOOD diet which focuses on natural foods which are unprocessed. The GD diet we advocate is perfectly healthy and suitable for anyone who is trying to conceive or who is already pregnant. Prepregnancy physical activity was assessed in 34,929 total participants, which included 2,813 cases of GDM, giving a pooled odds ratio (OR) of 0.45 (95% CI 0.28–0.75) when the highest versus lowest categories were compared. Exercise in early pregnancy was assessed in 4,401 total participants, which included 361 cases of GDM, and was also significantly protective (0.76 [95% CI 0.70–0.83]). CONCLUSIONS Higher levels of physical activity before pregnancy or in early pregnancy are associated with a significantly lower risk of developing GDM. Inositol, also known as vitamin B8, is a naturally occurring product found in a variety of foods. The body also produces its own inositol. There are 9 different types of inositol. Myo-inositol can be found in cereals, corn, green vegetables and meat. It can also be taken as a supplement in powder or tablet form. Myo-inositol plays a part in many of the body's functions, one being sensitivity to insulin. Due to this, there have been a few studies into the use of myo-inositol and gestational diabetes. A meta analysis of studies using myo-insoitol supplementation concluded that this supplementation may reduce the risk of gestational diabetes. On the basis of current evidence, myo-inositol supplementation reduces the development of GDM, although this conclusion requires further evaluation in large-scale, multicenter, blinded, randomized controlled trials. Relationship Between Myo-Inositol Supplementary and Gestational Diabetes Mellitus: A Meta-Analysis. Zheng X, Liu Z, Zhang Y, et al. Medicine (Baltimore). 2015;94(42):e1604. There have been many studies in the use of myo-inositol supplementation in pregnancy with studies showing that the supplementation of 2g twice daily alongside 400μg folic acid daily, may reduce the incidence of gestational diabetes and have some other beneficial outcomes, such as reduced rates of neonatal hypoglycaemia. However, as these are still small studies, with the supplement still being in it's trial stages for being used as a preventative measure for gestational diabetes, myo-inositol is not currently classed as safe for use in pregnancy. In the knowledge that a second gestational diabetes pregnancy is likely, when and how should you be screened for gestational diabetes in subsequent pregnancies? Policies vary from one hospital to another and although subsequent gestational diabetes pregnancies are a recognised risk, we could only find actual specific recommended guideline for testing within the NICE guidelines. Get testing. You may not have a second gestational diabetes pregnancy, but in the knowledge that it's likely and that GD is often diagnosed earlier in the subsequent pregnancy, we think it's worth keeping an eye on what's going on. If you still have your old test monitor, it may need calibrating (depending on the age), new batteries and you may need new consumables (lancets and test strips) too. Your GP should be able to prescribe these items for you. How soon can gestational diabetes recur? 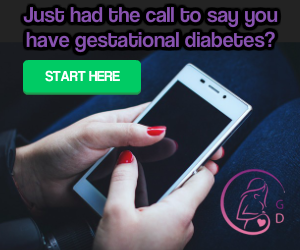 We have seen plenty of women be diagnosed with gestational diabetes very early in subsequent pregnancies. In my personal experience, I start testing my blood sugar levels as soon as I fall pregnant and have always seen a rapid rise in my blood sugar levels and this is despite having annual diabetes screening tests showing non diabetic fasting levels and non diabetic HbA1c levels. Finding high blood sugar levels early on in pregnancy may be an indicator of pre-existing diabetes and so your diabetes and antenatal team may deem you as having pre-existing diabetes or pre-diabetes [blood sugar levels which are high but not quite high enough to be classed as diabetic at this point, but likely to develop into diabetes and so interventions such as dietary advice should be given]. This is not a diagnosis of type 1 or type 2 diabetes. This simply means that they are being cautious in case diabetes had developed prior to pregnancy, which can increase some of the risks of diabetic related complications in pregnancy. What to do if you find high blood sugar levels before your midwife booking appointment? If you start monitoring blood sugar levels very early on, before you have had a booking appointment with the midwifery team and find elevated levels, then it is best to speak to make an appointment with your GP who can refer you straight through to the hospital diabetes team as soon as possible. If your GP is not able to help with this, you could discuss the levels with the midwifery team to see if they could refer you, or failing this you could contact the antenatal diabetes team at the hospital directly. Please do not be deterred from seeking a referral to the antenatal diabetes team. We have seen a few cases where midwives and GPs have suggested that pregnant women wait for a routine GTT at 24 - 28 weeks, or get testing levels confused with those of non pregnant diabetic levels and this is very concerning with having such a higher risk of gestational diabetes developing earlier on.